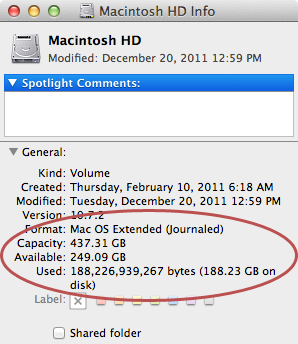 Ever wonder how much free space is available on your Mac's hard disk or partitions? 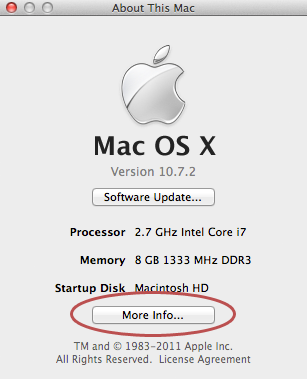 It's easy to check in OS X. Plus, if your Mac is running Mac OS 10.7 or later, the interface shows which types of files are taking up the most space, a feature that could help you track down space-hogging files and applications. Click More Info. The About This Mac window appears. Click Storage. The window shown below appears. Use this window to check how much hard drive space is available on your Mac. The startup disk is shown at the top of the list; other partitions are shown below. Notice that you can see how much of your hard drive space is being consumed by audio files, movies, etc. This information could be useful when your hard drive is nearly full and you need to delete some files. Switch to the Finder, and then open a new Finder window. From the sidebar, select your hard disk by clicking it once, as shown below. From the File menu, select Get Info. The window shown below appears. 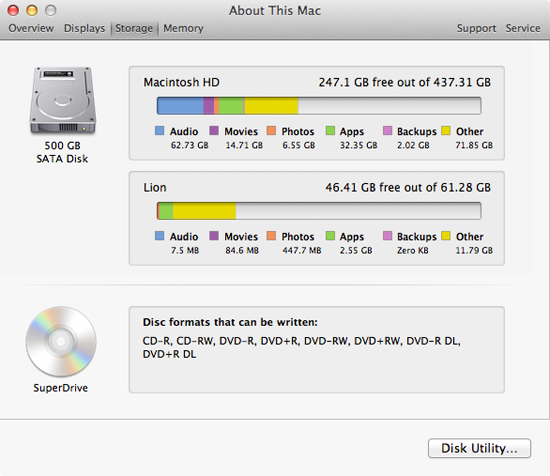 The window shows the disk space available on your Mac's hard drive. Unfortunately, there's no slick interface like the one in 10.7 or later, but at least you'll know whether or not you're running out of space on your hard drive.